The Golden Flowered Agave is a member of the agave family (what did you expect?). 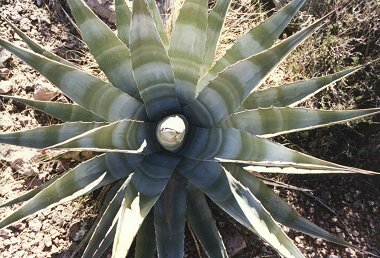 This large agave has bluish green leaves to 20 inches in length with teeth on the edges and a very sharp point. Leaves grow from a central location to form a large rosette. 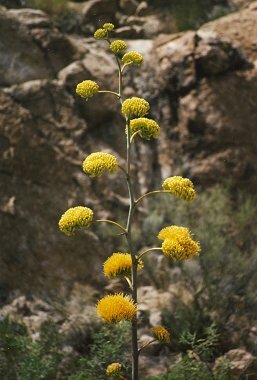 The plant can typically be found growing on foothills and in mountains and canyons between 3000 and 6000 feet in elevation. Native Americans roasted the flower stalk of the Golden Flowered Agave for food. The plant blooms only once during its lifetime. When the plant reaches maturity, it produces a large flower stalk, which grows to 20 feet in height. The stalk produces clusters of up to 300 yellow flowers between June and August. After blooming, the plant begins to whither and die.